Note: Double yarn overs are turned into two stitches on the following row by working “p1, k1” into them. Cast on 27sts and knit 1 row. Row 1 (WS): Sl1, k2, yo, p2tog, k2, (yo) twice, k2tog, k18. Row 2: Sl1, k8, yo, k1, yo, k9, p1, k1, p2, k2, yo, k2tog, k1. Row 3: Sl1, k2, yo, p2tog, k2, p1, k10, p3, k9. Row 4: Sl1, k9, yo, k1, yo, k12, p2, k2, yo, k2tog, k1. Row 5: Sl1, k2, yo, p2tog, k2, [(yo) twice, k2tog] two times, k7, p5, k9. Row 6: Sl1, k10, yo, k1, yo, k10, p1, k2, p1, k1, p2, k2, yo, k2tog, k1. Row 7: Sl1, k2, yo, p2tog, k2, p1, k12, p7, k9. Row 8: Sl1, k11, yo, k1, yo, k16, p2, k2, yo, k2tog, k1. Row 9: Sl1, k2, yo, p2tog, k2, [(yo) twice, k2tog] three times, k7, p9, k9. Row 10: Sl1, k12, yo, k1, yo, k12, (p1, k2) twice, p1, k1, p2, k2, yo, k2tog, k1. Row 11: Sl1, k2, yo, p2tog, k2, p1, k15, p11, k9. Row 12: Sl1, k13, yo, k1, yo, k21, p2, k2, yo, k2tog, k1. Row 13: Sl1, k2, yo, p2tog, k2, [(yo) twice, k2tog] two times, (yo) twice, sl1-k2tog-psso, (yo) twice, k2tog, k7, p13, k9. Row 14: Sl1, k8, k2tog, k9, ssk, k8, (p1, k2) three times, p1, k1, p2, k2, yo, k2tog, k1. Row 15: Sl1, k2, yo, p2tog, k2, p1, k18, p11, k9. Row 16: Sl1, k8, k2tog, k7, ssk, k19, p2, k2, yo, k2tog, k1. Row 17: Sl1, k2, yo, p2tog, k2, [(yo) twice, k2tog] two times, [(yo) twice, k3tog] two times, (yo) twice, k2tog, k7, p9, k9. Row 18: Sl1, k8, k2tog, k5, ssk, k8, (p1, k2) four times, p1, k1, p2, k2, yo, k2tog, k1. Row 19: Sl1, k2, yo, p2tog, k2, p1, k21, p7, k9. Row 20: Sl1, k8, k2tog, k3, ssk, k22, p2, k2, yo, k2tog, k1. Row 21: Sl1, k2, yo, p2tog, k2, [(yo) twice, k2tog] two times, [(yo) twice, k3tog] three times, (yo) twice, k2tog, k7, p5, k9. Row 22: Sl1, k8, k2tog, k1, ssk, k8, (p1, k2) five times, p1, k1, p2, k2, yo, k2tog, k1. Row 23: Sl1, k2, yo, p2tog, k2, p1, k24, p3, k9. Row 24: Sl1, k8, k3tog, k25, p2, k2, yo, k2tog, k1. Row 25: Sl1, k2, yo, p2tog, k2, [(yo) twice, k2tog] two times, [(yo) twice, k3tog] four times, (yo) twice, k2tog, k17. Row 26: Sl1, k17, (p1, k2) six times, p1, k1, p2, k2, yo, k2tog, k1. Row 27: Sl1, k2, yo, p2tog, k2, p1, k37. Row 28: Cast off 18 sts, k19, p2, k2, yo, k2tog, k1. These 28 rows form the pattern. Repeat for the desired length. 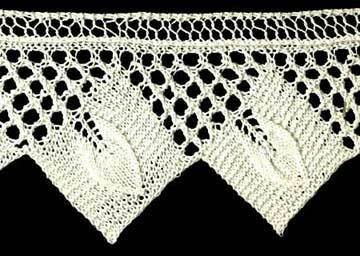 The chart shows the lace with the wrong side facing you. Double yarn overs are turned into two stitches on the following row by working “p1, k1” into them.